Thai Cuisines are known all over the world for their vibrant colors, refreshing and tasty ingredients, and unique zests. Now if you are craving for the real Thai taste, then it is the time to celebrate as you can find many Thai Restaurants right here in Dubai, from the common street food stalls to the modernly equipped restaurants. The vivacious Thai dining scenes along with wide arrange of lip-smacking food items of the restaurants automatically stimulate your taste buds. Read for the list of the best suggested Thai Restaurants in Dubai and select your favorite one according to your requirement, taste and budget. 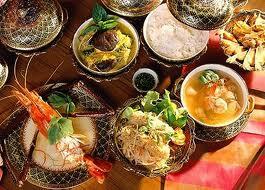 Thai cuisine holds its own importance among the rest of fares in the world because of its freshness and light effect. Due to this reason, food lovers in different corners of the world adore this cookery. This list of Thai food admirers also includes inhabitants of Dubai, who often visit Thai Wok Restaurant in Al Barsha region in order to savour the delectable dishes of Thailand. These dishes of Thai Wok Restaurant range from subtle to intense flavours therefore it caters all types of foodies. In addition to this, chefs of this bistro also ensure that the quality and taste of food should remain first-rate therefore they add fresh ingredients and imported herbs in each dish to produce a lip smacking delight. Holiday Inn Hotel in Al Barsha is another venue, where people of Dubai can find a fine dining Thai restaurant. This premier restaurant is called the Royal Budha and it serves authentic Thai cuisine that echoes the true spices, flavours and texture of this far eastern fare. As far as diversity is concerned, menu of the Royal Budha would not let its guests down, as it is quite wide-ranging and full of different flavours. Guests can get pleasure from these delicious Thai dishes in an elegantly deigned interior, which is perfect to relish food with friends or families. Arabian Courtyard Hotel & Spa that is situated in the locality of Bur Dubai has an exclusive restaurant in it that attracts lot of locals and tourists, who love to consume Thai and Chinese food. These two cuisines are the highlights of this eatery, which is known as Silk Route Restaurant. Here guests will get specialities of both Chinese and Thai fare, which includes Satay, Pad Thai, Dimsum, Pecking Duck and much more. To make the dining experience even more incredible fine assortment of beverages is also offered to the guests at this eatery. You can also hire Silk Route Restaurant for private corporate functions. Like Silk Route, Twin Spice restaurant also invites people of Dubai to relish both Thai and Chinese dishes under one roof and enjoy a premier culinary treat. Ascot Hotel in Bur Dubai has the honour to have such a special eating place in it, where talented chefs create dishes by following conventional recipes and adding authentic ingredients. Therefore, the food of this bistro is always found rich in flavours and gives the right aroma that will tinkle your taste buds at once. Visiting this restaurant will not be less than a gastronomic journey, which guests will hardly able to forget. Expert chefs of O Zone Restaurant carefully play with various herbs and spices to bring the desired flavours in their Thai and Chinese dishes, which they serve fresh to the guests from their live kitchen. This wonderful eating place is to be found within the Lotus Boutique Hotel that is in Deira, Dubai. Several people also book this venue for organising private events and functions too therefore O Zone Restaurant is quite popular among the locals. This restaurant is located inside Park Hyatt Hotel of Deira, Dubai and it has won an award for its excellent services. These services include serving of delectable Thai cuisine and a few south-east Asian dishes in diverse settings. As this bistro has four different kitchens, out of which three are open and seating of customers are placed close to them so they could see chefs in live action. In this way guests also remain sure that what they are eating is hygienic and prepared fresh. There is a lot of variety in Thai food as well as in Thai restaurants of Dubai Marina. Among these restaurants, Black Canyon Restaurant is one fine example which one can give in this regard. This authentic Thai eatery is located near ‘The Walk’, where food lovers come to take a dip in the magical Thai culinary which is created by the talented chefs of this eating place. One of the top venues to relish Thai food in Dubai is Buddha Bar because besides offering food, this site also features a bar with an extensive range of cocktails and other beverages. Moreover, Djs allures guests with their contemporary music. Therefore, visitors can do a lot of things at Buddha Bar besides consuming traditional Thai cuisine. This restaurant is well-known for producing contemporary Thai cuisine and European food because of which its clients get a wide-ranging menu to select the food from. To compliment this extensive menu, staff of Dusit Gourmet provides quick service as well. The interior is also decorated nicely, therefore guests get a warm and cozy environment to enjoy the food. Aside from its location and attractive decor, Royal Orchid Restaurant also serves delicious Thai fare which comprises of various regional dishes of Thailand. Guests can immediately sense the exotic flavors of their dishes, as fresh ingredients produces terrific aroma that can tinkle anyone’s taste buds right away. This award winning eating place at Al Bustan Rotana Hotel is well known for its luxurious decor, first-rate hospitality and mouth-watering Thai food, which is savoured not only by the occupants of this facility, but also by the locals and residents of other areas of Dubai. The treatment of the staff is also warm and welcoming, which makes this restaurant even more appealing. Le Méridien Hotel in Al Garhoud area also has a fine Thai eatery that offers inspirational food from the Sukhothai times. Ancient recipes of Sukhothai’s time are followed by the talented chefs of this eating place to revive the luscious flavours and aroma of their tradition.